We were developing a saturn version in parallel with the PS version. I wasn't involved directly with it myself. If I remember rightly, the guys involved were doing some pretty clever stuff to get it working on the saturn. The tracks were being done with the character maps, which could be tilted and rotated using the saturn hardware. 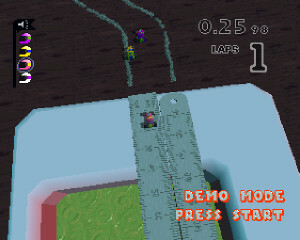 The cars and objects were using the polygon hardware, which wasn't as fast as the playstation. Anyway - I think the project was abandoned after a while. Perhaps because there wasnt enough of a market to justify the continued development expense. It wasn't a simple conversion, like the PC version. 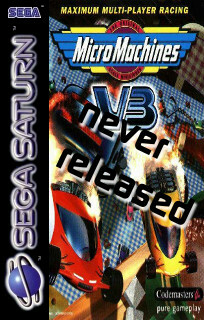 I don't remember how complete it was when we stopped work on it; it wasn't finished anyway, I think you could race around some tracks at least. We did some tricks like using the sound CPU (68000) to render the 3d cars into sprites because the saturn 3d hardware was so... quirky. We even tried to hack into the SH-1 that controlled the disk to get that do rendering as well. We did a fair bit of work in rendering the vehicles with our own triangle software rasterizer onto sprites, and using the h-blank trick to get the hardware to do a 3D world surface. It was a challenge to get the whole 3D world to render. The C-code base was fairly compatible with both compilers and we had some simple stuff up and running. The problem was performance and getting the 8 cars to all render. If I recall we finished up a lot of the UI foundation and had one or two cars running around one or two flat circuits, with Audio (depending on which day it was and what changes had been made to the PS1 code that week!). The project was then cancelled, so I'd say it was "fairly unfinished" rather than "complete but unshipped".